Guest reviews are written by our customers after their stay at Croft House. We had a great stay at this lovely B&B in Lynton. The landlady was very helpful, providing information and advice from the point of booking right up to our departure. Breakfast was splendid, with a great range of vegetarian options. Authenticiteit op alle gebied, zeer vriendelijke ontvangst en kraaknet! + De sfeer. Bijzonder net en verzorgd. Prima ontbijt, zeer uitgebreid, veel vers fruit. Erg vriendelijke gastvrouw. Friendly, clean , comfortable and helpful. +Friendly, clean good breakfast. Very welcoming. – No car park on site. But with a voucher from B+B to put on your windscreen, there was a council car park 3 minute walk away. Helen was very nice and helpful , we really enjoyed our stay and were made very welcome , many thanks for all your info, highly recommend a stay here . Super stay! It was homely, welcoming, wonderful breakfast, caring, thoughtful great host, the best! 19/.09/18 Anthony , (ZA) Rating 10. A cosy home from home for travellers wanting to stay in the heart of the Lynton community. In the heart of Lynton Close to pubs, restaurants and local attractions. Ideal for hikers wanting to explore Exmoor. Lovely cozy guesthouse in beautiful Lynton +We were made to feel extremely welcome. The breakfast was really great and the rooms very comfortable. We had a fantastic stay. Wouldn’t hesitate to recommend to friends and family. + Lovely breakfast,the host Helen was wonderful.Always helpful and friendly.Our bedroom was too small.That was the only downside. Lovely cozy guesthouse in beautiful Lynton + We were made to feel extremely welcome. The breakfast was really great and the rooms very comfortable. We had a fantastic stay. Wouldn’t hesitate to recommend to friends and family. Excellent B&B, Highly Recommend +Helen was a fantastic host. She made us feel at home straight away and was very helpful. The breakfast was also excellent. The room was nice and cosy and had everything you would need, including a good powerful shower. Lynton and Lynmouth are great and definitely worth visiting. +Friendliness. Helen was a super host always ready to help.This lady had a good knowledge of the area and asked guests daily of planned walks etc. Liebevoll geführtes B&B Sehr herzliche Gastgeberin, die sich wunderbar auskennt und wirklich gute Tipps gibt. Das Zimmer war sauber, das Bett bequem und das Frühstück sehr lecker. Das Allerbeste am Zimmer war die Badewanne – sehr erholsam nach einer langen Wanderung! + Charming house great place to stay.The landlady was very helpful ,nothing too much trouble and very knowledgeable of the area,first class,the breakfasts were delicious to.would definately recommend to my friends. the guesthouse has lots of character and very clean. +Der perfekt Ort um Exmoor und die Küstenregion zu besuchen. Die Gastgeberin war sehr freundlich und hilfbereit, Da englische Frühstück war überaus gut. +Excellent value for money. 10 out of 10 for service and friendliness from Helen. It was a home from home experience , Helen a lovely ,warm ,friendly lady and nothing was too much trouble . -Nice room and bathroom but would have liked a bit more space in both. +All excellent, many thanks to Helen! +Relaxing & enjoyable in a very scenic location. Location & good local knowledge by the owner. -More hot water in shower. +Location was perfect, hostess made you very welcome, Hotel was spotlessly clean, a lovely holiday. Very friendly hostess who was very knowledgeable about the place, the hotel was spotlessly clean and nothing was a bother to her. -Wasn’t able to get parked near b&b, but could use the public car park. +So impressed that i am already planning to visit again. Made to feel welcome from the moment I walked in. Quaint property, lovely hostess, very comfortable bed and brilliant choice for breakfast. Nothing was too much trouble, great customer service -Nothing that i didn’t like. )+L’ospitalità dell’oste (Helen) è stata davvero eccellente! Le camere sono molto pulite e ben arredate – il b&b è davvero molto confortevole. La colazione era buona e le porzioni abbondanti. Massima attenzione e cura per gli ospiti da parte di Helen. Rapporto qualità-prezzo decisamente ottimo. -Impossibile trovare un commento negativo! +A quaint and character filled stay. The bed was large and comfy. Very quiet area but accessible to everything. Owner was very friendly and extra helpful. A delightful place to stay- we thoroughly enjoyed it. +Heerlijk! Ontbijt was prima. De regeling voor parkeren was heel welkom. Wat me bijzonder beviel was de rust in huis en in de tuin. Prima plek om een boek te lezen. De gastvrijheid van Helen was bijzonder aangenaam. -Niets. +Comfortable room and ideal location for a short break, thanks Helen. Helen was fantastic, her knowledge of the local area was impressive. Ask her for advice on where to go and she will give you lots of good suggestions. -The smell of the soap in the bathroom was somewhat overpowering. 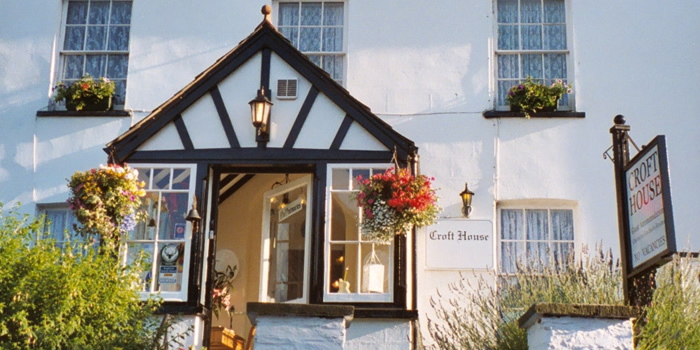 + Relax at Croft House in Lynton. The whole house was lovely-as was Helen.Slept and ate well! -It rained one day! + Heerlijk ontbijt. Zeer vriendelijke gastvrouw. De kamers zijn proper en alles is voorhanden. Nicht noch einmal .Eigentlich nur die Umgebung und die Restaurants in dem Ort. Die Heizung mussten wir einfordern. Zu kleines Frühstücksbuffet. Der Frühstücksraum. Die klassische Musik im Wohnzimmer hat nicht immer gepasst. + Very good B&B in lynton. Helen is a beautiful host,everything was perfect, and the breakfast are very good -Everything was perfect. +Helen was welcoming and very helpful with information about the area. Made every effort to ensure we were comfortable. – Parking was either on street or local car park about 100 metres away. Excellent location. Helen the owner was the perfect hostess serving a brilliant breakfast with lots of choice. Great stay, we were very comfortable and very well looked after ! Lovely house, very picturesque. Great character to the property. Cosy B&B in the centre of Lynton + “Very welcoming and helpful owner. Gave us good suggestions for activities.” – Small en-suite facilities but clean and adequate. A wonderful relaxing friendly place to stay + “The B&amp;B owner was very friendly and attentive. The B&amp;B was very clean and there was a lot of attention to detail with the furniture, paintings. It is a very homely place. Very relaxing and quiet in superb location.” – It was perfect. “Helen was so friendly and helpful. The place felt unspoilt. Great B and B in a fantastic location. Bring your walking shoes and leave the car. Amazing Helen + “Helen and Pat are most amazing hosts. They tend to your every need and nothing is too much. They know the local area and give all the information needed. The accommodation is very tastefully decorated. The finer detail is what makes the place outstanding.” – That we had to leave. Best B&;B we’ve ever found. + “Extra caring welcome when my husband wasn’t well; comfy beds, great shower. Helen is a special lady. Perfect. Loved the decor too a cross between Laura Ashley and French Provencial in our suite.” – Can’;t think that anything could have been better! Highly enjoyable stay, highly recommended. + “High standard of cleanliness. Helpful owner. Delicious breakfast.” – Was perfect as it is. Lovely homely stay in beautiful cosy village + “Helen the hostess is a lovely lady, very friendly and helpful. Lovely quirky homely house, clean and comfortable wth very tasty breakfast! Highly recommend.” – nothing! + “Breakfast, location, friendly and efficient staff” – Room and bathroom small. Top floor room a little chilly. + “Spotlessly clean. Very comfortable and quiet. Charming character. Delightful hostess. Very nice breakfast.” – No parking available despite what Booking.com state. Free on street if you can find it or a pay carpark 150m down the road. Doesn’t really detract from a very nice B&B but be aware. + “Homely, flexible, friendly, informative with interesting furnishings.” – En-suite bathroom too small for comfort in ‘Rutland Retreat’. + “Well placed in the town, friendly host” – The add should say that the ensuite is tiny. Bed was small but described on paperwork as king bed. Also parking is a do your best on the roads, not guaranteed ‘free nearby’. + “Lovely wellcoming atitude! Very nice breakfast! Cosy lounge. Very helpful and service minded.” – A bit cold but we got extra heater in room! + “Owner did all she could to ensure we enjoyed our stay. Very helpful advice about local area, places to visit, restaurants, etc. Lots of hot water and comfortable beds. Great breakfast.” – Dining area was a little cramped when all rooms occupied. Some have chosen to enter their reviews on the Trip Advisor site.